Co-working space provider Awfis is eyeing expansion into Tier-II towns and consolidating its presence in Tier-I cities. But it is not just office spaces that the company is planning to tap. Awfis will also utilise commercial spaces such as shopping malls, hotels and other unconventional asset classes as co-working spaces. Low rentals are one prime reason for the company to explore these alternatives, sources said. Some of the Tier-II towns it is currently eyeing include Kochi, Jaipur, Bhubaneshwar, Ahmedabad and Indore. According to Amit Ramani, CEO & Founder, Awfis is planning a 60 per cent increase in seats to 40,000 over the next 10-12 months spread across 100 centres. Its current capacity stands at 25,000 seats, about 1.5 million sq ft, across 55 centres, which makes it the largest in the country. “Commercial office spaces apart, we are also looking at idle capacities in unconventional asset classes like a shopping mall or hotel or even educational institutions where co-working spaces can come up,” he told BusinessLine. Ideally, the company would look at taking up 25,000 sq ft, accommodating 500 seats and other facilities like cafeteria and meeting rooms. Awfis either leases space or opts for a managed aggregator model. Upcoming spaces will mostly focus on the managed aggregator model that includes rent-sharing JVs or management contracts. “We are in discussions with some of the landlords who own such unconventional assets for conversion,” Ramani said. Co-working space is expected to be a $2.2-billion market in India by 2022. Awfis has already established a presence in malls that have seen a dip in footfalls and have under-utilised spaces, such as the top floors. It has set up co-working offices at Ambience Mall in Gurugram, Raghuleela and Heera Panna malls in Mumbai, and Nucleus mall in Pune. It also has a presence at the Taj Deccan hotel in Hyderabad and at the DERBI Foundation, Dayanand Sagar University in Bengaluru. Approximately, 10 per cent (or 2,500) of its 25,000 seats are located in such unconventional assets. The co-working space provider reported revenues of₹57 crore in FY18 with 85 per cent coming from primary activities such as seat rentals, meeting room facilities and parking space rentals. The remaining comes from canteen and catering services. It is expecting a three-fold jump in revenues to ₹170 crore by the end of this fiscal (FY19). The company is expecting to report net profits (at a company level) from October onwards. “Of the 55-odd centres that we have, 42-47 are profitable,” Ramani said. Awfis, the co-working spaces and solutions provider, has turned profitable in little over three years since its commencement . The company, which could be considered a startup, has grown to 30,000 seats across 10 metros and cities with 63 centres up from 3,000. It is now looking at entering five more cities with its co-working spaces. These cities include Indore, Ahmedabad, Bhubaneshwar, Kochi and Jaipur. This will enable us to take our presence to 15 cities with over 100 centres with total seating capacity of 60,000 seats, he said. “Our plans is to grow the business at a rapid pace and take the company to an IPO within the next three years,” he explained. In India co-working space is poised for growth and the enormous opportunities it presents Awfis will enable us to consolidate and expand at a rapid pace. We had raised over $ 51 million and the growth momentum continues, he said. 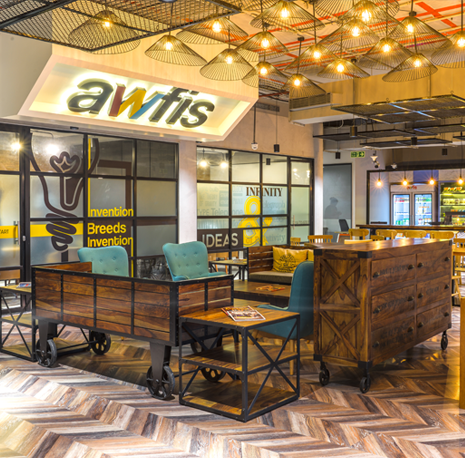 Co-working space major Awfis is on a rapid expansion mode and now plans to double its seats from 25,000 and 55 centres to 50,000 and 100 centres by June-July 2019. The workspaces provider has grown from its first facility three years ago to 25,000 seats, about five months ahead of its its initial planned March 2019 date, and is now looking at doubling the number each passing year. Earlier this year, Awfis had raised $20 million in Series C funding from Sequoia India and Innoven Capital and The Three Sisters: Institutional Office TTS:IO led by Radha Kapoor Khanna. with the $20 million Series B funding from Sequoia, the overall funding exceeds $50 million. The co-working space as a category has been growing at a rapid pace as it is able to transform under-utilised real estate assets, including spaces in malls and some hospitality projects into efficient work spaces for entrepreneurs and corporate clients. This is a win-win situation for the real estate owner, for Awfis as also for those who take up space. By 2020, Awfis is looking at 1,00,000 seats and taking this number up to 2,00,000 seats with 400 plus centres a year thereafter. The industry now estimated to be worth about $600 million is projected to grow to $2.2 billion by 2022, thereby offering immense scope for a services provider like Awfis. The demand is coming not just from micro-markets in large metros and major cities but from a number of Tier II cities, where there is untapped demand. Over the last 12 months a about 80 per cent of the business has come from small and medium enterprises and corporate entities. This trend is expected to continue, with start ups too accounting for a growing numbers, Ramani said. Awfis, a shared workspace provider, has raised $20 million in series C funding from Sequoia India and Innoven Capital and The Three Sisters: Institutional office (TTS:IO) led by Radha Kapoor Khanna. Sequoia Capital had earlier invested $20 million in Awfis as part of a Series B funding. 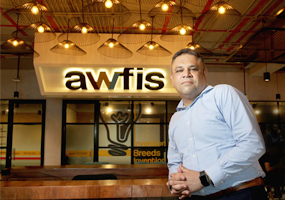 Awfis Space Solutions was jointly incubated by Amit Ramani and The Three Sisters: Institutional Office with a capital of $11 million in April 2015. The fresh capital infusion will be used to bolster and deepen the Awfis network across India, launch new and innovative products/services and further enhance the existing technology platform. In the last fiscal year, Awfis scaed up to 25,000 seats across 55 centres, with a member base of 15,000+ as compared to 5,800 seats in 20 centres with a member base of 4000+ in July 2017. The member base at Awfis includes a growing network of more than 1,200 companies ranging from India’s leading start-ups/ MSMEs to Fortune 500 companies, forming the largest co-working community in India. Companies such as Hinduja, Vodafone, Mercedes Benz, RBI, Hitachi, ShareKhan, Zomato and Practo operate from various Awfis centres. Abhay Pandey, Managing Director, Sequoia Capital – India said: “Awfis has generated tremendous momentum with its unique supply acquisition models. It is re-creating the workspace landscape for the benefit of both tenants and landlords. Sequoia strongly believes in the opportunity created by Amit and the team, and will continue to back Awfis to retain its leadership position in the Indian shared workspace market.